Jewish Humor Central: Second Seder Inspires Parody - "Same Thing As Before"
Second Seder Inspires Parody - "Same Thing As Before"
Love it or hate it, the second seder is a fact of life everywhere except in Israel. Some find it annoying to have to do the same thing all over again for two nights in a row. But to many people who work hard for weeks before Passover -- planning, cleaning the house, shopping, and cooking mainly for the big night, having a chance to do it again offers a unique opportunity to revisit the themes of the Haggadah and related readings in a more relaxed atmosphere, while enjoying more special foods and sharing conversation with another set of guests. 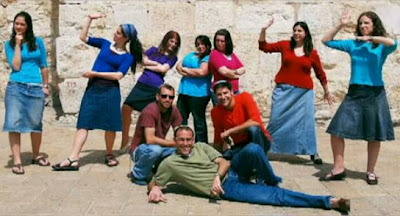 The idea of the second seder as the "Same Thing As Before" was set to music by KOLture Shock (שוק תרבותי), an a cappella group of Israelis and English-speaking students and olim living in Jerusalem. The group, which uses only their voices -- no instruments -- took the song Just the Way You Are by pop singer Bruno Mars, and wrote new lyrics reflecting the attitude that the second seder is "a second trial for all the Jews still in exile." We prefer to view it as "a second look at all the shortcuts that we took" the first night. Enjoy the video!